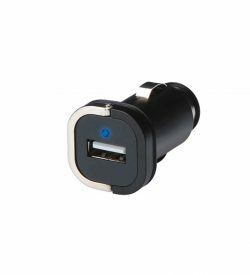 Chargers | View our catalogue products | SiliconBlue Corporation Ltd.
Universal USB Charging Adapter for mobile devices Universal USB Charging Adapter for mobile devices. The Universal USB Charging Adapter allows you to quickly and efficiently charge your mobile devices, regardless of whether you’re at home, in the office, or on the go. It is suitable for all kinds of mobile devices, such as tablets, smartphones, cameras, speakers, etc. 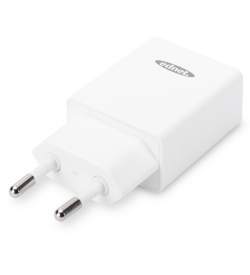 Includes 8 different adapter 240V / 12-24V output voltage 1A for various mobile phone models. 2-port, max. 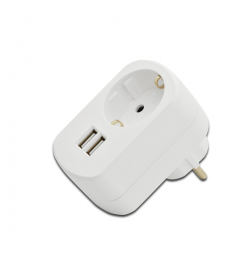 5V/2.5A, 3 plug, EU/US/UK, white. Different nations, different sockets. 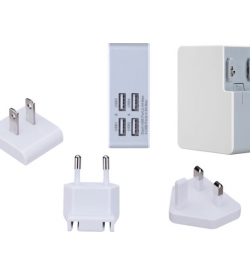 The ednet USB travel charger adapter set is the solution for the problem! 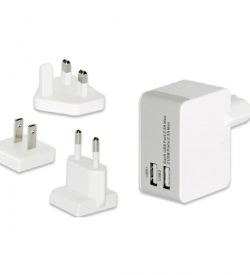 With its three interchangeable plugs to recharge your smartphones, tablets,cameras, etc. in more than 100 countries. Equipped with two USB ports can charge up to two devices simultaneously. 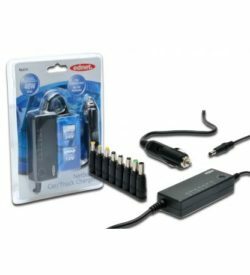 The adapter provides a maximum of 2.5A total output (max. 2.5A per output) to ensure the rapid and effective and Tablets store. 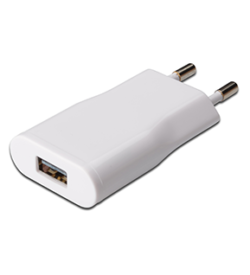 Recognizing the intelligent USB ports, what type of device is connected and provide the required charging current. 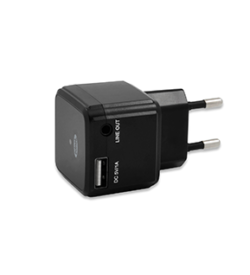 With ednet USB travel charger kit you are now well prepared for every trip abroad, be it for business or holiday. Charge your phone and tablet at the same time. The socket remains free! Free outlets are as coveted as rare in many households. Not anymore, because the ednet Power USB Adapter will keep the socket free. Thanks to the two integrated USB ports, you can even charge your smartphone and your tablet at the same time. The total output of 3.1 A max. (1x 1 A, 2.1 A 1x) invites your devices to quickly and optimally. 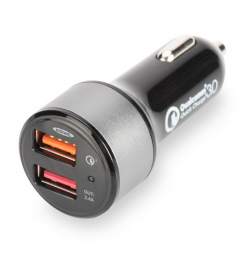 Tiny USB car power adapter - perfect to charge your USB device while travelling. Whether you need to charge your iPhone, smartphone or MP3 player, this adapter will power up your electronic devices in no time. Compact and convenient, an LED light comes on to notify you when your device is charging. NETBOOK CHARGER CAR/TRUCK, Power Output 40W Compact 40W universal Netbook car/truck power adapter with selectable power output to assure compatibility with the most netbook models. 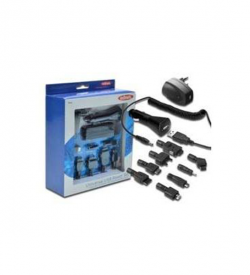 Charge your Netbook trough your 12V car cigarette lighter or trough the 24V socket in your truck 8 different Netbook connectors included. Selectable power output: DC 7,5/9,5/12/15/16/18,5/19 V. Protected against overload, short circuit and overheating. 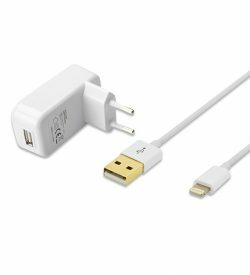 Apple iPhone Car Charging Kit, 1m Adapter + Apple cable, car cigarette adapter cable 1m, USB 2.0 comp, UL, MFI, wh, gold. Universal iPhone® Connection set for charging via a USB car charger adapter or for synchronization with the computer. 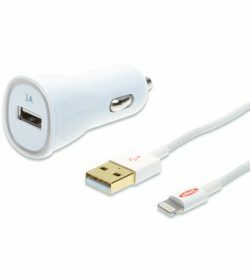 Supplied car charger adapter for the cigarette lighter socket iPhone® USB 2.0 Data / Charging Cable, white, 1.0 m.
LED indicator for charging process, This compact, universal USB power adapter set enables a fast, efficient charging at home, office or on the go. LED power indicator, Input Voltage: 100-240 V AC, 50/60 Hz, Output Voltage: DC 5 V, Charge rate: 2.1 A, MFI certified.